In the 1920s the first Bangladeshi, mostly single men from Sylhet in the north, arrived in Brick Lane. Packed into tiny bedsits and rented rooms, they laboured on the docks, in sweatshops and in clothing factories. 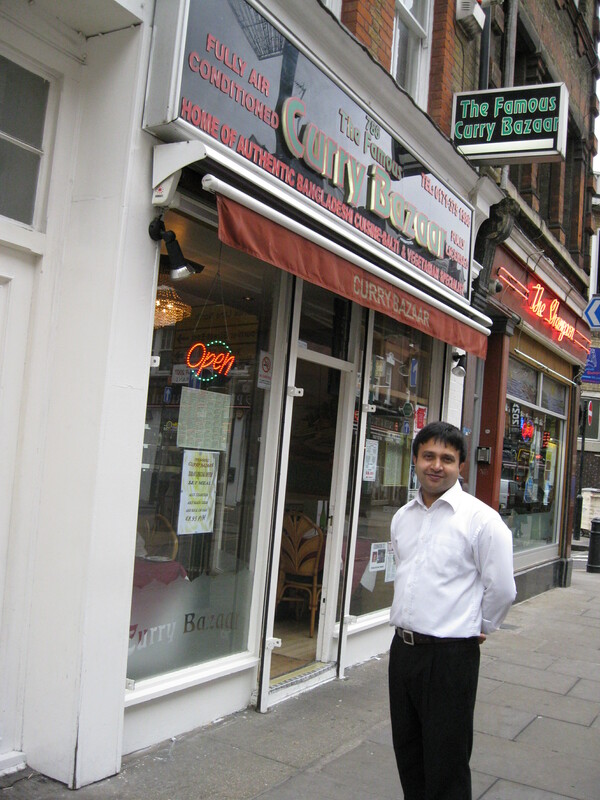 The first curry houses opened and the great tradition of Anglo-Southern Indian cuisine began. Now, the south end of Brick Lane is Banglatown, the heartland and the symbol of British Bangladesh. Here, Monica Ali set her controversial novel Brick Lane and here, outraged Bangladeshi took to the streets to protest against Brick Lane the movie which followed it. Here the call to prayer brings out old and orthodox Islam, the patriarchs, the matriarchs in hijabs and the fervent, bearded young. Signs in Sylheti and English point the way to the mosque. Bangladeshi businesses line the pavements; money exchanges, travel agents, barbers, Islamic goods, leather ware, music and book shops. There are food stores stacked with fragrant, brightly packaged produce and piled with exotic fruits and vegetables, like Taj, which flies in Halal meat and fresh fish daily from the Bay of Bengal. There are fabric houses like Epra, crammed with bales of sumptuous sari silk, gorgeous brocades and cottons of amazing colour and design, all at giveaway prices. There are seventy Indian restaurants, the highest concentration in the world. Curry is now a staple of the English diet and heading down to Brick Lane for a tikka is almost as much a London tradition as stepping out to the pub for a pint. Choosing a restaurant is a ritual; there are menus to browse, celebrity endorsements to check and curry touts’ deals to consider. Monsoon, self-proclaimed “best of Brick Lane” is endorsed by the Beckhams. Housed in a narrow Hugenot terrace with a wide dark curving staircase, its style is old Raj, with layered tablecloths, heavy silver and fine china edged with Indian filigree. Indian art festoons the walls. The house specialty is chicken tikka masala, best teamed with spicy thali, smoky naan, samosas, coconut rice and Kingfisher beer. (Monsoon, unlike many other establishments, has a bar) A picturesque dessert menu shows pages of flamboyant fluoro-coloured, fruit-flavoured ice-cream extravanzas with fanciful names, like Royal Cup. In the background of lads’, tourists’ and city types nights’ out, family life plays out – a bored schoolboy polishes glasses behind the bar, a teenage girl in a hijab takes a break at back table, a gnarled grandmother watches from the kitchen door, a suave, avuncular maitre d’, patronises the punters and lords it over the long-suffering and endlessly obliging young waiters. This short stretch of Brick Lane might seem another world, an exotic add-on from the Indian subcontinent, but it’s very much a part of modern Britain.